The lack of a working fire alarm can very literally be the difference between life and death. This map uses data visualization to highlight regions where there may be a lack of smoke detectors, to help cities ensure their citizens remain safe. The project builds on an earlier project that from 2014, which tried to calculate which areas of New Orleans needed fire alarms after five people died in house fire in the city, in a building that lacked a detector. But a team at Enigma has now chewed a lot of data to produce a model which predicts which blocks in cities around the U.S. are likely in need of fire alarms. 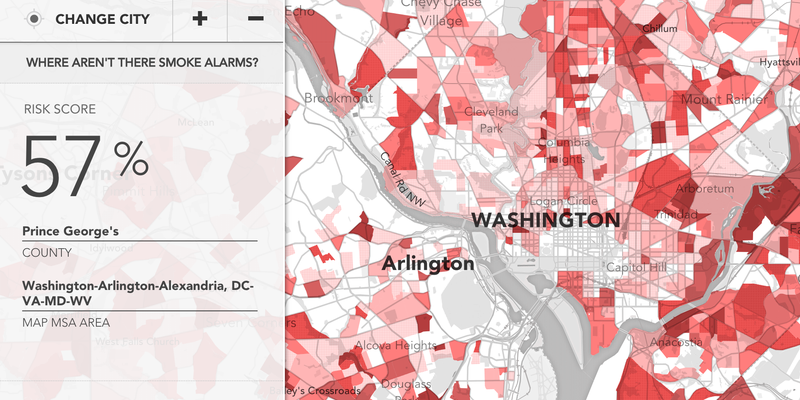 It uses data from the American Housing Survey and American Community Survey to create a block-level estimation of whether residents are likely to have a working smoke alarm. The idea is that a city administration could focus on providing smoke detectors to those that don’t. You can read about how they’ve done it here. It’s not perfect: the data’s noisy and patchy, which is something the team is working to improve. But it’s a good first step in helping to keep people safe.